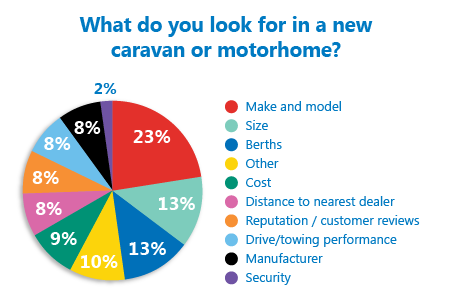 Last month we asked the question on everybody’s lips during spring buying season; What do you look for in a new caravan or motohome? Let’s see how the rest of you voted! The voting was close this time around, but a 23% majority of you told us that make and model is what you look when buying a caravan or motorhome. Do you agree with the majority? Share your comments below or have your say in our latest online poll which this month is all about fifth wheel caravans. We are looking for a 4 birth van with an Island bed and an ‘L’ shaped lounge. Such as the Eddis Odyssey 550 and the Crusader Mistral, this is such a brilliant design especially Please tell what is wrong with manufactures? We were at the last NEC caravan show looking to purchase such a unit, when we were told by one of the sales staff (properly tongue-in-cheek but) ‘ You must be the 400th person I have told today, there is NO call for that design’. Thanks for getting in touch. I guess it’s frustrating when you know exactly what you’re looking for. Did you go for the Eddis Odyssey 550 or the Crusader Mistral in the end? Thanks for your comments Tony & Rob. Manufacturers are beginning to develop their own construction techniques such as Elddis’ Solid construction and Swift SMART which demonstrates that there’s a real focus on these areas. (1) Berths – Will the van suit our accommodation requirements. (2) Weight – Is the MTPLM a suitable match for my towing vehicle. (3) Size – Will it fit in my storage location. (4) Layout – Does the Sleeping Accomodation (Fixed Bed etc) & Kitchen arrangement match our requirements. (5) Build Quality/Cost – Both have a major impact in the selection process although the former is difficult to assess completely until after a period of usage. A slight tangent, but I think that caravan manufacturers must really address their quality issues which seem to be as bad as British Leyland in the 1970s if the reports I see are to be believed. This month’s Caravan Club magazine talks of a new caravan that was a “Friday build” with a long list of faults. This is just unacceptable! Most manufacturers today who care about their customers and reputation have a Zero Defects target and relentlessly pursue root causes of defects. Time for caravan manufacturers to get into the 21st Century please.